Then treat yourself to $1 Coffee on Monday, 4/15. Offer valid 4/15/19. One time use only. Excludes Cold Brew and Frozen Coffee. Limit one per transaction. Almondmilk and espresso shots may be subject to an additional charge. Discount Offers can only be earned during the promo period on eligible purchases made using a DD Card enrolled in the DD Perks Program or other accepted form of DD Perks payment in participating markets. 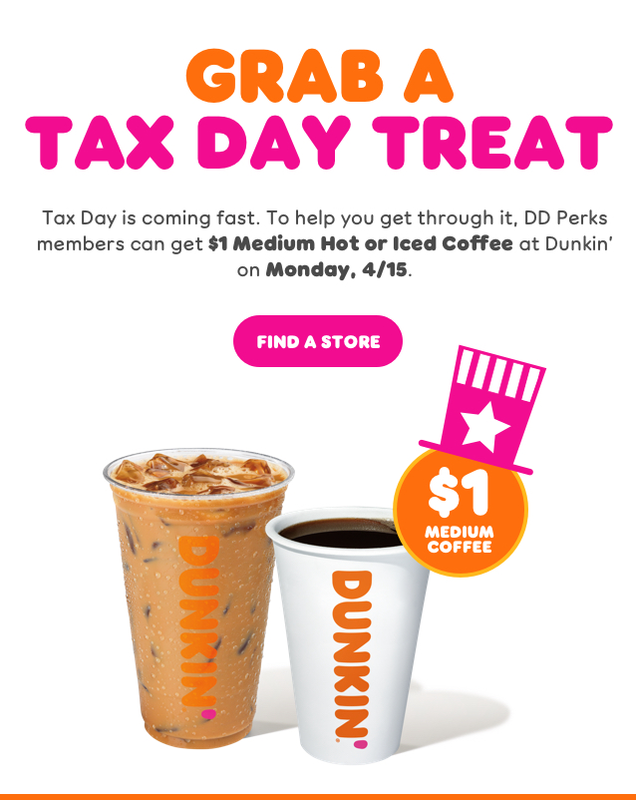 Valid at participating Dunkin' Donuts locations. DD Perks Program accepted only at U.S. participating Dunkin’ Donuts stores. For full DD Perks Program terms please visit dunkindonuts.com/terms. Did you get this email from a friend? Skip the middle man. Enroll in DD Perks Rewards Program. For more information, please visit DunkinDonuts.com. Read our privacy statement. © 2019 DD IP Holder LLC. All rights reserved. The Dunkin' Donuts trademarks, logos and designs are registered trademarks of DD IP Holder LLC. PLEASE DO NOT REPLY TO THIS EMAIL. If you believe you received this message in error and/or do not wish to receive further emails, please click here. Thank you. If you prefer to contact us via the Web, please visit the Contact Us page on DunkinDonuts.com.